This made me think: before proceeding, I wanted to obtain the fingerprint out-of-band, via a trusted channel, so that I could verify it. So I took a console cable, logged on via the serial console, and … then I started to wonder what IOS command to type? A couple of hours later spend with Google, I was no closer to a solution. I could not find an IOS command to display the SSH fingerprint. I found forum posts advising to connect via a crossover cable and write the presented SSH fingerprint down, but that’s not what I wanted. I had to work out my own solution. If you take the modulus and exponent of your public key, arrange them in another format (ssh-rsa) and calculate the MD5 hash, then you obtain the fingerprint. If you know a Cisco IOS command to obtain the SSH fingerprint key directly, then please post a comment. 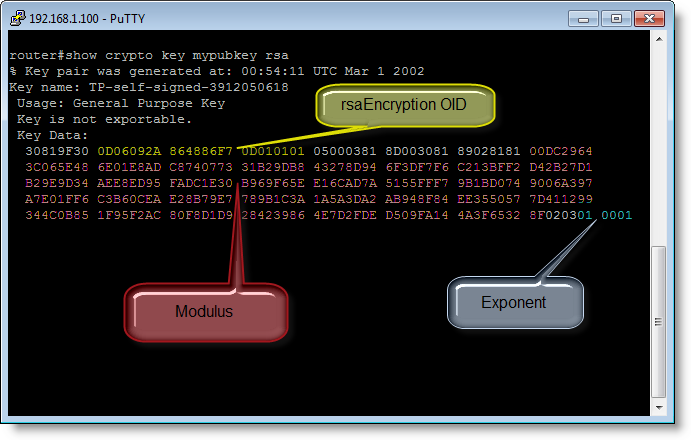 If you decode the base64 encoded ssh-rsa data, and calculate the MD5, you obtain the fingerprint.